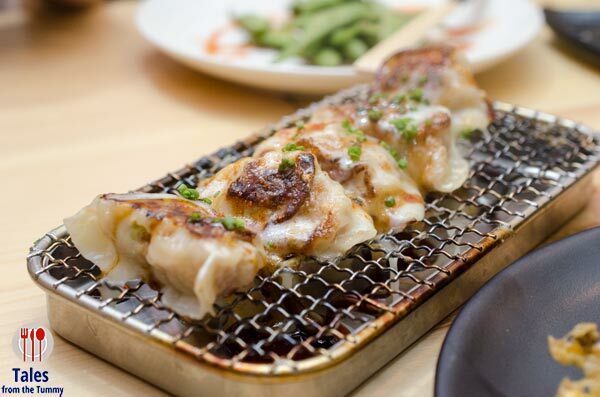 OOMA Japanese Rice Bar is the newest venture by Chef Bruce Ricketts and the Moment Group (Cue, 8 Cuts, Linguini Fini, Manam, Phat Pho, Mecha Uma). 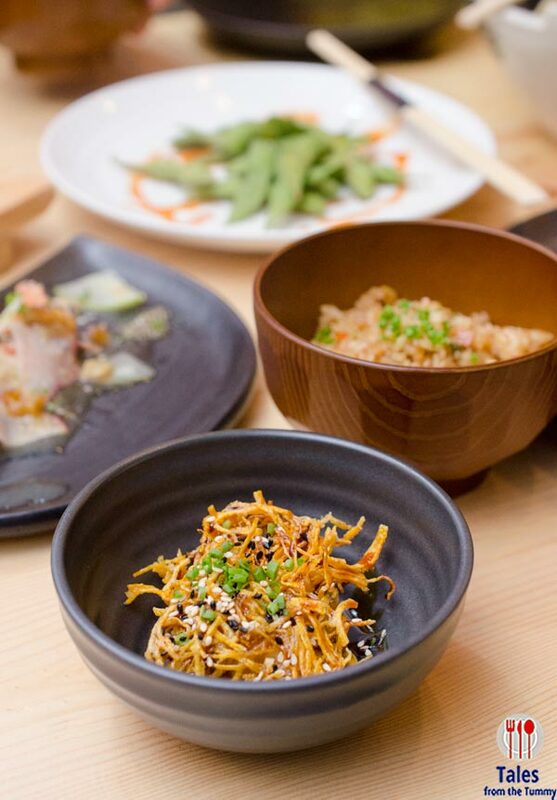 Ooma is a play on the Japanese word umai which means good. Set to open to the public on July 8, 2015 at 6pm, the restaurant will be serving familiar Japanese food infused with modern flavors. A well designed space with lots of interesting elements inspired by a bustling fish market. 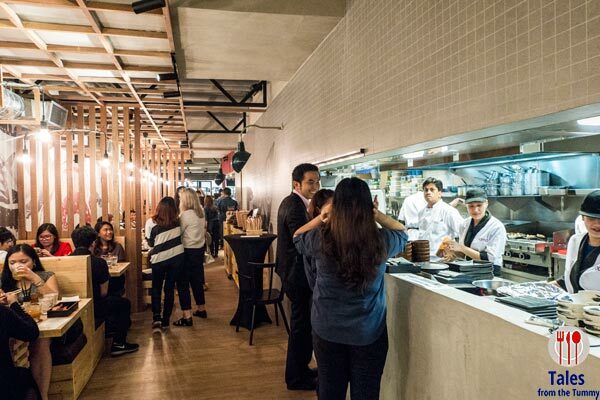 The sushi bar is situated as you enter Ooma while the open kitchen is in the back near the windows facing EDSA. 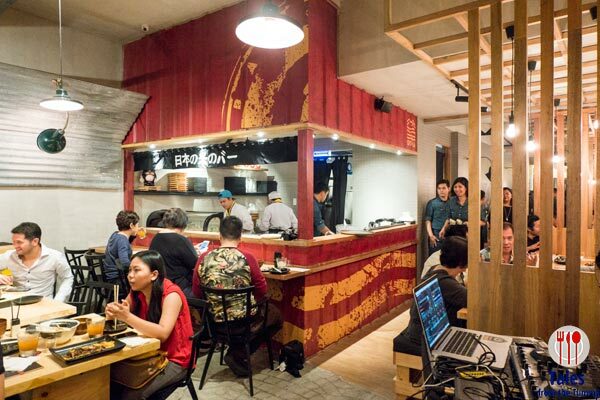 There are large communal seating, booths and a few seats in the sushi bar. We had a little sneak peak into the Ooma dining experience. 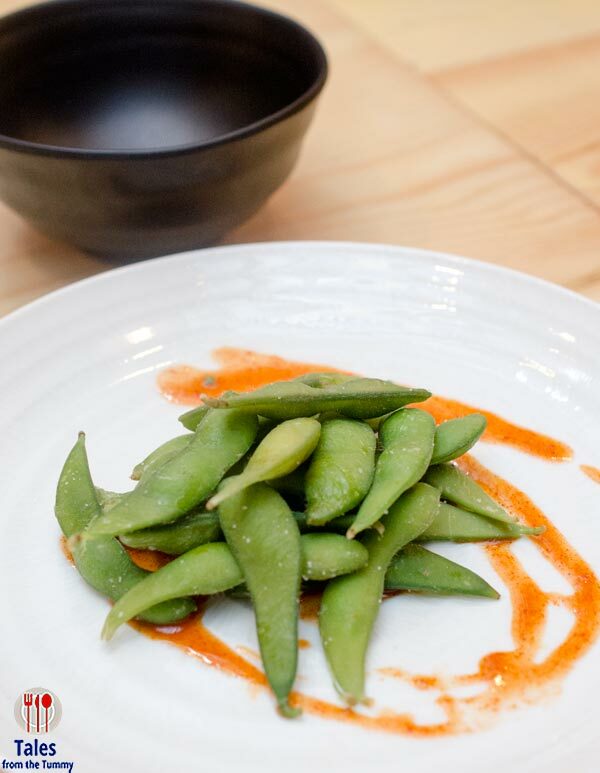 We started with a plate of Edamame (P115), drizzled with fiery kimchi sauce. A good starter but avoid the kimchi sauce if you dislike spicy food. 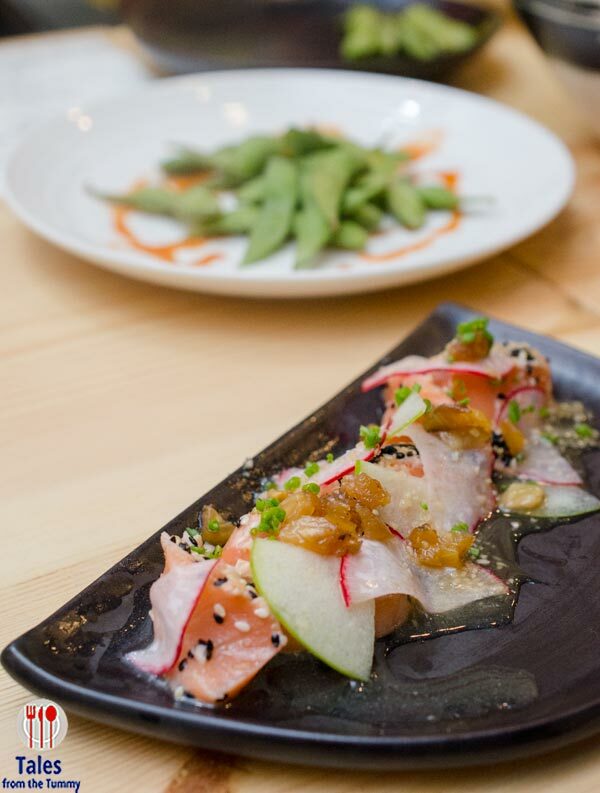 Salmon Tataki (P195). Sesame crusted salmon with garlic ginger sauce, roasted pineapples and pickled red radish. The roasted add a dose of sweetness to complement the tangy flavors of the vinegar and ginger sauce. Ooma Maki Sampler (P225-P345). We had a sampler of Ooma’s signature aburi sushi and maki rolls. No soy sauce dipping dishes are given because Chef Bruce wants you to paint the soy on the makis to maintain the presentation. 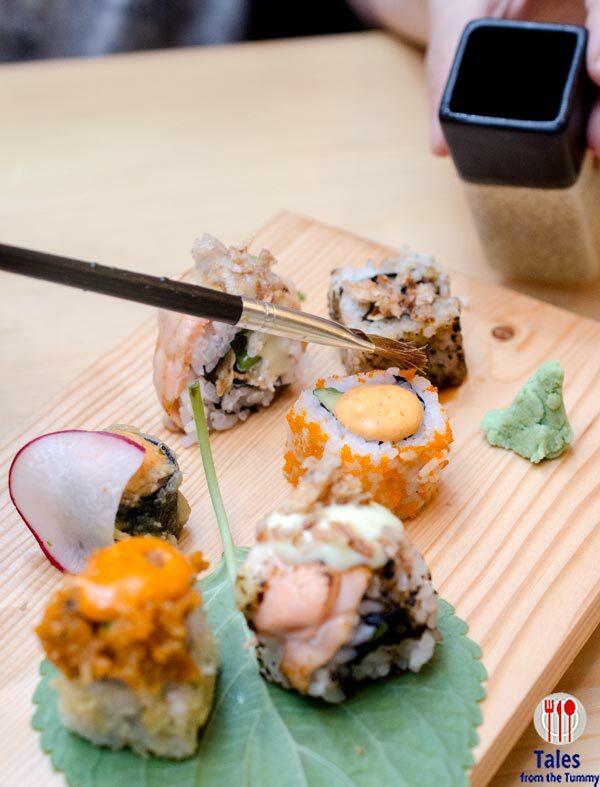 All were well created with the Aburi makis getting an edge because of aroma and the smoky flavors from the torching. California Taco Maki (P135/2 pcs.). 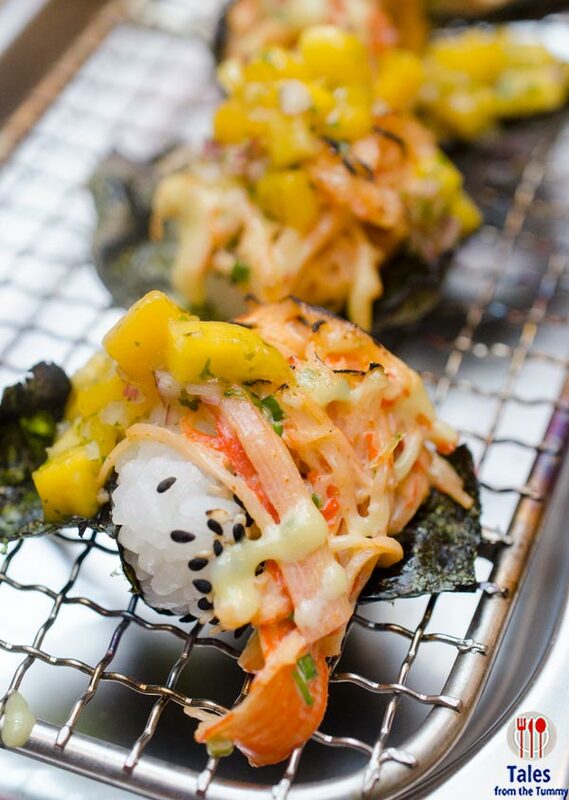 A mash up of tacos and temaki (sushi rolls). Served open faced and torched before serving, each one is meant to be eaten with your hands like a taco. There’s a burst of flavors as you pop it into your mouth and will have you thinking why has anyone not served it like that before. Corn and Oyster Kakiage (P155). 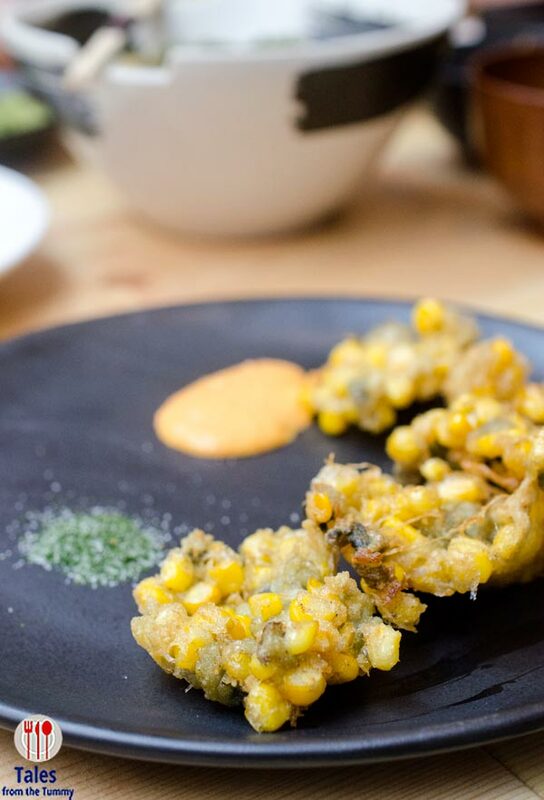 Japanese sweet corn and fresh oysters, mixed together and deep fried for a crunchy appetizer. Served with nori salt (my personal choice) and kimchi mayo dressing. I like the sweet corn flavors but the flavor of the oyster got lost in it. I’ll have to give this another try on a subsequent visit to fully judge it. O-Gyoza (P235/ 5 pcs.). The chefs missed the mozzarella and cheddar cheese topping of the gyoza served to our table in the chaos last night. The presentation is nice but be warned that it is hot because they torch it first before serving. Filling wise, there was nothing spectacular about the gyoza. 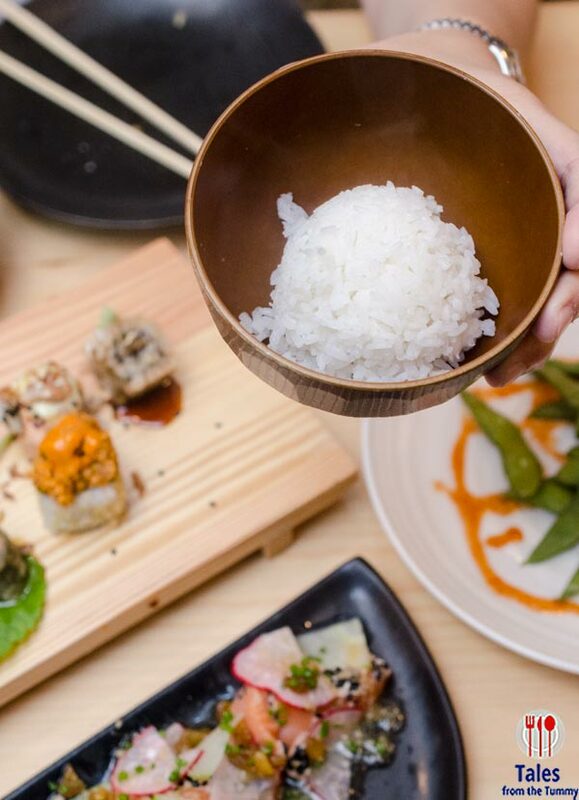 Can’t get enough of rice, Ooma is a Japanese rice bar so they give out complimentary unlimited rice for any order, from appetizers to main dishes. The one pictured above is a small serving, no need to stuff the bowl as you can ask for more. Hanger Steak (P495). 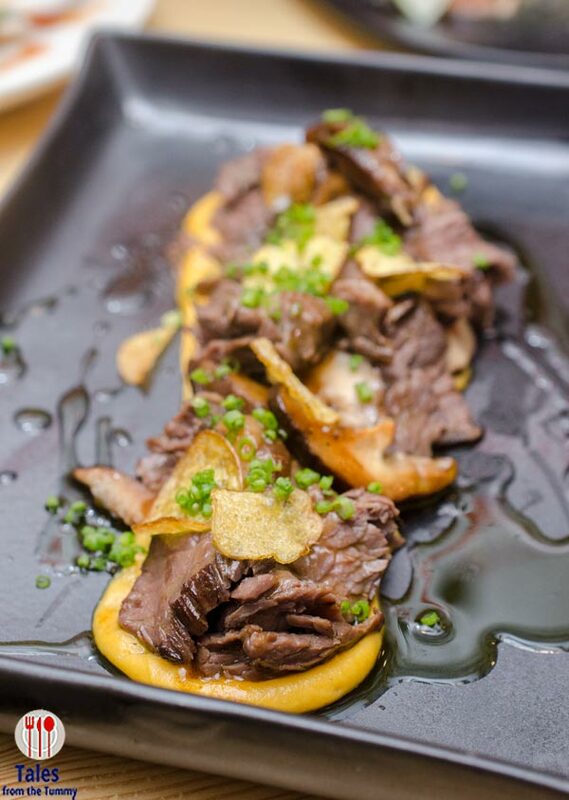 Sous vide hanging tender steak with a bed of sweet potato mash, topped with sauteed mushroom crispy baby potato and drizzled with ponzu sauce, pickled dressing and white truffle oil. Tender and beef meat that goes perfectly with the complimentary bowl of rice. Good value for the serving size. Tori Kara-Age (P245). Chef Bruce gives the classic Japanese fried chicken a whole lot of crunch. The chicken thigh are coated in sweet potato strips for lots of fun textural crunch and finished off with a sweet and lip smacking good sauce. This one surprised me because I was prepared for it to be meh from the menu. One of my favorites was the Uni Udon (P495). Udon with fresh uni, shrimp, mushrooms, nori crumb and scallions and uni cream sauce. Before eating, be sure to mix everything up to coat the udon with everything. 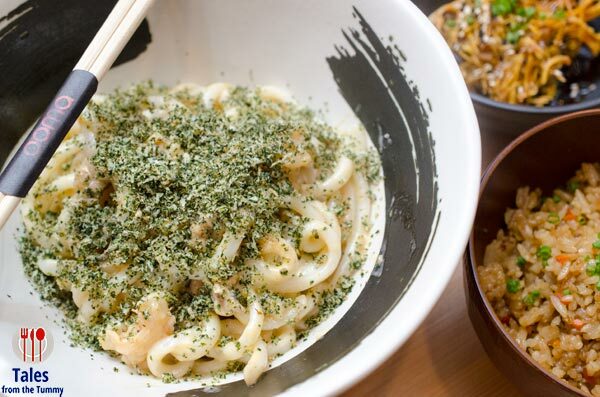 A creamy and filling noodle dish that is reminiscent of carbonara but with umami flavors from the sea. Green Tea-ramisu (P195). I’m not really sure if this is the serving size but logical thinking says it’s not. 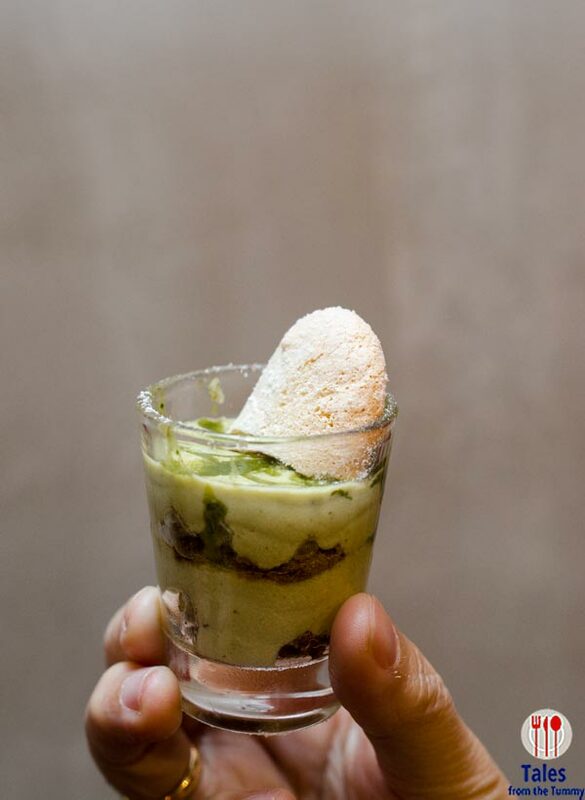 Chef Bruce has added a dose of Matcha green tea to create an Italian-Japanese dessert. Strong green tea flavors while not tasting grassy will excite it’s many fans. 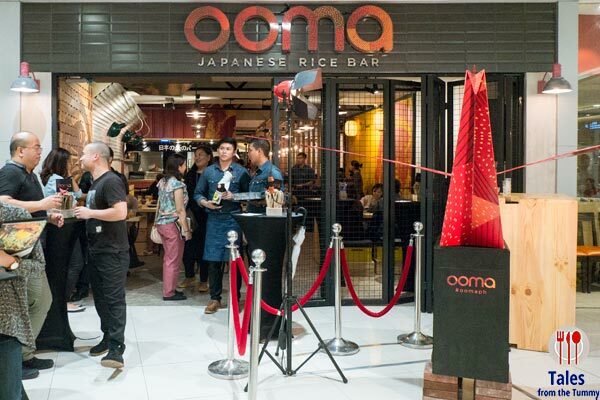 Ooma Japanese Rice Bar gives SM Megamall diners a new, more hip dining location for their Japanese food cravings. Dishes range from P150-P500 with the only outlier being the Rib Eye steak at P995, good pricing for the location and quality. I’m excited to try more dishes especially the donburi bowls. From my initial experience I’d recommend ordering the hanger steak, aburi makis and the tori kara-age. It’s another must-try foodie destination when in SM Megamall. All food presentation looked creatively unique. The dishes are exquisite. Try if you are in the area. I’m eager to go back to try more dishes.